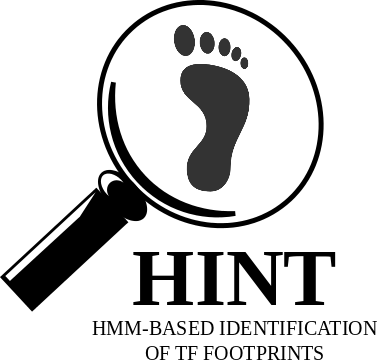 HINT (Hmm-based IdeNtification of Transcription factor footprints) is a framework that uses open chromatin data to identify the active transcription factor binding sites. This method is originally proposed to model the active binding sites by simultaneous analysis of DNase-seq and the ChIP-seq profiles of histone modifications on a genome-wide level (paper). The HMM has as input a normalised and a slope signal of DNase-seq and one of the histone marks. It can, therefore, detect the increase, top and decrease regions of either histone modification and DNase signals. And we next modified HINT to allow only DNase-seq data by removing the three histone-level states and the use of bias-corrected DNase-seq signal before normalisation steps (paper). Recently, we extended HINT to ATAC-seq, a new assay to identify accessible DNA regions, taking the protocol-specificity into consideration (paper). to install HINT. Further installation instructions are found here. If you have any questions, comments, installation problems or bug reports, please access our discussion group. Note: You need to follow these instructions to download the genomic data for cleavage bias correction. We describe here how to detect footprints using HINT for ATAC-seq, DNase-seq and histone modifications data. To perform footprinting, you need at least two files, one with the aligned reads of your chromatin data and another describing the regions to detect footprints. You can use a peak caller, such as MACS2, to define these regions of interest. to tell HINT your preferred output directory and name. Each footprint, i.e. each line of the BED file, will contain information regarding the tag-count score (number of reads) of each footprint. This score can be used as a footprint quality assessment (the higher values indicates better candidates). In addition, a file including the details of reads and footprints will also be written in the same folder of BED file. Currently, the default setting is hg19. Find here for more information. Currently, the default setting is hg19. The complete tutorial and more descriptive examples are found in here.